AP New APSCERT Proposed Timings for Primary,Upper Primar and High schools.New School Timimngs fro Schools in Andhra Pradesh.Instructions from AP DSE to DEOs in AP.APTEACHERS have to follow new timings as per DSE Intructions,Proposed by SCERT.New Time Table for APSCHOOLS as per RTE. SCERT Proposed new School Timiings for Primar,Upper Primary and High Schools in AP. The State Council of Education Research and Trainings (SCERT) has proposed changing the school Timings from 9am to 4.30pm in Govt Schools as required under Right to Education Act.So in the refference cited below the Directior,SCERT as submitted School Timings and details of the periods for Primary,Upper Primary and High Schoolsin term s of the Propositions of RTE act.Studets spend 45 hours a week in school. In this connection Andhra Pradesh State Project Director ,Sarva Shiksha Abhiyan and Commission and Director oof School Education has given orders to DEOs,RJDs. School Education Dept-RTE-New School Timings-Certain Instructions Issued to follow strictly to function schools as per new timings-orders issued. SCERT has submitted school timings and details of the period for Primary,Upper Primary and High Schools in terms of propositions of RTE ACt.All the District Educational Officers are hereby instructed to adapt the New School Timings and also Academic Calendar. 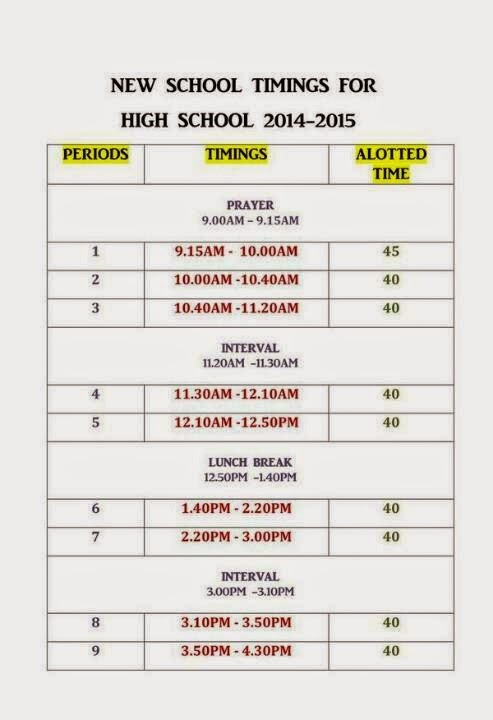 The Headmaster of each school in Andhra Pradesh should follow time table given below.